Ukrainian Christmas being the 7th January, we get a long Christmas break here in Kyiv. This is one of the advantages of Ukraine over teaching English in Asia, where you are lucky to get Christmas Day off. We had a week over Christmas and New Year to spend with family and friends, and then a week post-New Year. Where shall we go? I asked Kris. And so it was decided. We’d head to Marrakesh for a week in early January for some winter sun before winter properly hit Kyiv. Another positive for Morocco is that it’s so close to the UK, a mere 3 ½ flight from London Gatwick, and budget airline giant Easyjet fly there so we were able to get a decently priced flight. On New Years’ Eve we landed in Marrakesh airport, whizzed through passport control (UK citizens get 90 days visa-free entry) and out. We arranged an airport pickup through our hotel. We know it’s cheaper to get a taxi or bus, but it’s always so much extra hassle. You have to haggle with taxi drivers who have significantly inflated the price and then you are never completely clear on whether they are taking you to the right place or not. Meanwhile, you are tired and disorientated and carrying all your bags. It’s just not worth it for a few extra quid. Our pickup met us holding a big sign with our names on, and led us to a huge people carrier. One guy drove while the other told us a brief history of Marrakesh and all the things we needed to see and do. As we approached Jemaa del Fna Square, the main square in the old city, the streets became crowded with people waiting to see in the New year. Throngs of people walked around, wearing decorative hats and it was impossible to get the narrow streets. Instead, the driver called our hotel and the girls came to collect us from the street, leading us down narrow alleys until we reached a large metal door. Riad Sabbah is a traditional Moroccan style residence in the heart of the old Medina, just off the main square. Riad comes from the Arabic word for ‘garden’. Indistinguishable except for a decorative metal doorway, they open into a narrow alleyway and then into a central courtyard. Traditional riads are inward facing, so everything looks onto the central courtyard, which is often open to the sky. The ground floor has a terrace for eating and kitchen, and then the bedrooms come off the first floors. Our room opened onto the central balcony. On the same floor were two further bedrooms, and then above was a huge roof terrace with different areas for sitting and relaxing. Marrakech riads are generally made of pink concrete, like the rest of the city, and ornately decorated with coloured tiles, patterned rugs, and carved metal lights. The ceiling of our room was a work of art, both carved and painted to resemble ceilings in the palaces we would visit on our visit. An interesting observation is that they don’t have windows to the outside. Instead, everything looks inward, to the family. The streets outside can be hectic markets, but inside is an oasis of calm and tranquillity. Being open to the sky, with a covering to protect from the rain, birds get inside and fly around, stealing crumbs from the breakfast table and sing outside your room in the morning. Marrakesh old city, or Medina, is surrounded by a city wall made of pink stone with curved entry gates at various points along. The main square in the Marrakesh Medina during the day has snake charmers, men leading monkeys on leads, African drummers and dancers, women offering Henna tattoos on your hands and people selling a range of products from metal lamps, scarves and wooden snakes to knockoff football shirts. Around the edge, cafes have tables on terraces and on balconies where you can drink mint tea and watch things go on. In two areas, there are rows of stalls selling freshly squeezed fruit juice, and in another, street food stalls grilling kebabs, with jars and pots of tagine and tajia (meat cooked in a stone pot over a fire), and even boiled sheep head. Not just for the tourists either, there were many locals sat eating it. Of course, we had to give it a try. We sat down at a stall and order half a head each. It was ok. There were some odd textures going on and I wouldn’t eat another one. Spidering out from Jemaa Del Fna in all directions, narrow alleyways lead into the Souks. Each souk apparently used to have a different theme, so one sold carpets, another leather goods, another fruit and vegetables. While there is a less clear division now, they are amazing to explore. We started off trying to follow routes in our guidebooks, but that soon became impossible. Alleys twist and turn and small offshoots go off in all directions. It really is a maze and one best navigated by just walking to see where you end up. On each side are narrow shops selling everything: huge ornate metal lampshades, carved wooden masks, woolen carpets and rugs, silk headscarves, leather bags, brightly coloured homemade shoes, long Berber tunics, large silver jewellery…….the list goes on. If you want to go shopping there, the Wandering Wheatleys have a great guide to shopping in Morocco to help you with prices and how to haggle! Walking through is a combination of tourists and locals: women in long tunics with covered faces, men in long tunics with pointed hoods. Every so often someone behind shouts ‘Attencion’ as they attempt to drive a small truck ladened with more goods through, or navigate a donkey pulling a cart past. Meanwhile, people drive through on old motorbikes, reminiscent of Hanoi in Vietnam. Stalls had piles of herbs and spices outside and the proprietors told us about natural lipsticks, deodorants and creams. Some alleyways were workshops with people bashing leather into shape or carving ornate decorations onto wooden boxes. Dotted amongst all this are stalls selling patisserie style Moroccan sweets, or olives, carts full of oranges and pomegranates and offering various street foods like tanji (meat stewed in clay jugs), kebabs and fried fish. Often the souks looked very touristy, but take a turn down a different alley and you are away from the tourists and the touts and just walking through narrow lanes of riad doors and shop houses selling to locals – mobile phone cables, groceries, wood….narrow barbers and tailors. It is really easy to get away from all the hustle and find yourself on a quiet street with few other foreigners around. Sometimes over-friendly locals try to direct you back to the main square, or send you towards ‘the leather market – special offer today’. We’ve lived in Bangkok long enough to recognise that for the beginning of a scam. It’s never only today that it’s ‘special’ (in fact, they said the same thing every day) and it usually ends in you having to pay the person who helpfully ‘took’ you to it a tip, and then suffer high-pressure sales and guilt trips when you don’t want to buy. Not having any need for leather goods, or any room in our bags to carry them, we declined and walked a different way. As well as local food places, alleys open out onto small squares with cute little cafes offering mint tea or a special three-course meal. Alternatively, other eateries have roof terraces overlooking the hustle of the souks where you can relax over lunch. People complain about Marrakesh for all the people trying to sell you things all the time. They get overwhelmed by the attention and hassle. Having spent about seven years living in South East Asia, we are quite used to people selling us things. The trick is not to look at what they are selling, shake your head firmly and keep walking. No need to be rude, we smile and return greetings but don’t engage in a long conversation. It’s wasting their time as well as yours if you have no intention of buying whatever they are selling. We rarely get a lot of hassle in markets like this these days, and Marrakesh was no exception. In fact, what happened most of the time was men shouted ‘Ali Baba!’ at Kris. Not once, but many, many times. More times than we drank mint tea. We’ve yet to find out what it is about him that makes people think of the leader of the 40 theives though. Occasionally they also said ‘Nice tattoos’. Although speaking to him in English was very rare. Most of the time they conversed with him in Spanish. If you know Kris, you know that while we lived in Madrid for a while, he is by no means fluent in Spanish. However, he had some lovely chats with people on stalls where we were buying food in Spanish. This was the resident of the Grand Vizier (like the Prime Minister( in the 19th century. It’s a beautiful building made up of courtyards and gardens with rooms leading off. The floors are covered in stunning brightly coloured mosaics, the walls with amazing tiles and wood and stone carvings. The ceilings are incredible. Carved and painted, each one appears to be different. It was just 10 dinars to get in. This palace was in ruins as it was much older – 16th century. The walls are made of pink concrete but crumbling, with a huge courtyard with sunken gardens and pools in the centre. There isn’t any kind of roof, and storks have taken to nesting on the tops of the walls, their nests precariously balanced, the birds making loud clicking noises with their beaks. There were underground rooms which you can enter and which now show pictures, maps and displays on the history of Marrakesh. One of the other rooms is full of Marrakesh-insipired art from history including old French maps of the region and a painting of the ambassador to British during the reign of Queen Victoria. The 16-17th century tombs of the old rulers of Morocco were only rediscovered in 1917. The grounds are full of gravestones decorated in multicoloured tiles, of the minor wives and servants. The big mausoleums house the Sultans and their main wives and these have ornate columns and domed chambers. Again the ceilings are amazing feats of art: mosaics, carving and paintings all together. This cute little museum holds the collection of Bert Flint (with that name, he could only be an anthropologist), who explored the Saharan areas of Africa and documented it, collecting carpets, fabrics, jewellery and ornamental goods from each region. There are explanations in English, but they are a little…strange….However, it’s cool to see the differences between the tribes in the region. Again, it’s in a traditional riad which is interesting to see in itself. Dar Si Said is supposed to be one of the ‘must sees’ in Marrakesh, but honestly, we couldn’t find it. We found sign after sign with arrows pointing down alleyways, but no entrance. We followed signs, tried Googlemaps and the guidebooks and then gave up. I’m sure it’s lovely. We can check out the photos on Google. The house now contains both cultural items and more contempory art. The huge central courtyard has a spectualar brass lamp hanging in the centre and alcoves with exhibitions on pottery, textiles and other heritage topics. Some of the other rooms have modern paintings of Marrakesh and other topics (one was a drawing of a barechested man with a brick on his head). It was 50 dinars to get in. Another ‘must see’ that we missed was the Ben Youssef Medersa, a religious school from the 14th century. Unfortunately it was being renovated at the time we visited. Again, we’ll just have to make do with the pictures. This is the home of a local family who bought the properly and lovingly renovated it, turning it into a museum of Moroccan heritage. It’s a stunning riad with beautiful central courtyard and exhibits and information about jewellery, rugs, masks and carvings. On the roof there’s a lovely terrace where they give you free mint tea and you can chill out and look at the view. Marrakesh, isn’t just the old city, of course. There is also a new modern city that we wanted to explore. Outside the medina, the roads are wide, palm tree-lined boulevards. While the buildings are still built with the same pink stone, they are taller and wider. We walked down Avenue Mohammed V from the Medina, and as we walked, the traditional costumes were replaced with jeans and t-shirts, the motorbikes and donkeys with big new cars and more recognisable shops appeared – Pizza Hut, KFC, street front cafes and shopping centres. Instead of riads recognisable only be the doors, the hotels in this area are big and modern, Raddison Blu, Continental etc. Another of the ‘must see’ sights is in this area, so we walked to La Jardin Majorelle, apparently owned by fashion designer Yves San Laurent. Perhaps a lot of the other tourists were massive fashion fans, or maybe everyone was just heading to the ‘must see’ sights, but the queue was ridiculous. It was about five people deep and stretched the whole length of the gate. It seemed to also be ‘one in, one out’ so who knows how busy it was inside. We don’t know. We didn’t stop to find out. It reminded us too much of the seven-hour queue to get a visa at the Thai Consul in Vientiane. I’m sure the gardens are lovely. I’ll look them up online. I cant see how they can have been tranquil since we’d have been sharing them with 10,000 other people. That’s the thing with ‘must see’ lists from guidebooks and blogs. Everyone has the same list of places to go, places to eat etc. which makes them really really busy. Sometimes we wonder if the ‘must eat’ places just get so hyped up that they can’t possibly match up to people’s expectations. When we were in Nuang Schwe in Myanmar last year, we stopped to eat at one of the top 10 on Trip advisor places. We were told there was a 30-minute wait for a table. Who waits 30 Minutes for a table. It was just a small Indian place. It’s not like it had a Michelin star or anything. It was completely surrounded by other restaurants and eateries around too. Do they suffer because of the Tripadvisor Top Ten, or do they get more overspill from the people who don’t want to wait? There’s some great advice on practical issues when visiting Marrakesh in this post: DIY Travel itinerary to Marrakesh. You can also use Marrakesh as the start of a seven day Morocco itinerary. We flew to Marrakesh with Easyjet and paid £2xx each for return tickets and one 20 kg check-in bag. Our hotel arranged a pick up from which cost us 20 Euros. A taxi from the airport would have cost about 12 Euros but might have come with added arguments and hassle, and would not necessarily have had the history lesson included! 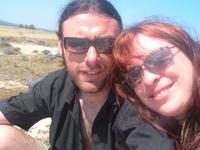 We booked Riad Sabbah on Booking.com and paid 199 Euros for four nights. Our room was beautifully decorated, had an en-suite bathroom and we got a massive breakfast of traditional Moroccan breads, freshly squeezed orange juice and mint tea every morning. The staff were incredibly helpful. There are two types of taxis, Petite taxis and Grand taxis. They differ in size. Grand taxis usually take groups between different cities, while Petite taxis are for within the city journeys. You just hail them by the side of the road. Even if there is someone else in the taxi, they will stop and drop different fares off at their respective stops. We took taxis to the bus station to Essaouira and to the airport at the end this way. There are several taxi ranks near the Medina, but we assumed they would overcharge, so walked up the road to avoid them. We bought the Rough Guide to Marrakesh which was full of great suggestions of where to visit, eat and drink and had lots of good maps. The Riad Sabbah lent us the Lonely Planet Guide as well, and that was also interesting with slightly different information. The combination of both was great. Proud to be a member of Facebook’s Feet Do Travel Group. Wow, a very comprehensive post! Seems you did a lot there, and had a great time. Maybe your experiences in Thailand etc helped, because honestly the endless hassling and pushing and selling and begging every 10 seconds really started to grate on me after a few days there. The weather was amazing in February last year when I went though, and the sights and culture are amazing for sure. But I came away with a slightly bad taste in my mouth due to having to be constantly switched on to avoid being ripped off. Love your pictures though, they kind of make me want to give it another chance! I would totally agree. South East Asia is very bad for hassle, but you learn how to deal with it after a while. Don’t look at what people are selling directly, just out of the corner of your eye. If someone offers you something, don’t be polite and look at them and say ‘no thank you’ because then they have your attention and won’t leave you alone. Just shake your head and smile and say ‘no’ (or learn how to say ‘no’ in Arabic) but don’t look at them. It’s how locals do it in Asia. What a really thorough introduction to Marrakech! We lived near Marrakech for six weeks a few years ago and I don’t think I knew or did half of these things! Reason to go back then, eh?? Marrakesh has some attractions which are eye catching. Very colourful destination and the gold plus mosaics makes the place very unique. How much did it cost to get there? And how did they celebrate new year? New Year brought everyone to the Square where they played loud music and hung out. There was a nice atmosphere, but no countdown. It cost about £200 to get there from the UK with EasyJet. This sounds like an amazing trip! I am dreaming about Morocco, I hope I can go there this or latest next year. Bahia palace looks so beautiful! Your trip sounded amazing! I’d definitely love to visit Morocco someday, especially Marrakesh. Interesting what you said about the hassling at the markets, comparing it to being in Asia. Fortunately since I’ve dealt with that living in China it sounds like I’d do just fine, and to think I was worried about that too! Your riad looks so beautiful as well, staying at a riad like that is top on my list! I’ve heard mixed reviews about Marrakesh, but I’m sold! That architecture is beautiful! I lived and travelled in Southeast Asia for a while as well, so hopefully the touting won’t phase me! I can’t see anything else that’s not to love about Marrakesh- I want to book a ticket now! It looks dreamy! Morocco is officially on my bucket list now. The art, architecture and the overall vibe i see from photos in instagram and posts like this are just incredible! I can’t wait for next year! Morocco is my favorite country in the world, I head back there every year for a visit! You hear that a lot though about Marrakech, people getting tired of the hassling. I’m glad you guys were accustomed to it and knew how to handle it, so that you could really enjoy the city! Go on! Try it next time. Marrakesh looks so beautiful! I could imagine myself getting lost within one of those markets. They look to have some beautiful, cultural pieces. I think I would struggle with the hassle but I guess I’m still new to it. I hope over time I get used to it and not feel so ‘on edge’ when in touristy places. There is so much information jam-packed into this post, it feels like I need to book my ticket to Marrakesh right away! First of all, I love how you have just tons of beautifully bright-colored pictures. It really feeds my notion of romanticism about Marrakesh and how I’d want to see it. I applaud you for being adventurous enough with food to try the boiled sheep head, even if it wasn’t your favorite. That’s a story that’ll stick with you forever! Merrakesh always looks so beautiful ! I loved all the information you provide! I definitely wouldnt want to haggle with taxi drivers though. Love this post – I really enjoyed Marrakech and it was such an incredible place to explore. Love the souks and the craziness of the main square. And of course all that mint tea! You guys look to have made the most of your time in the city! I bought one for my mum when I was in Marrakech at the end of February. It’s a wooden box that seemingly can’t be opened. You have to apply pressure in a certain way to get it open. Wonderful post by the way – you’ve really caught the essence of Marrakech. I love it so much, that this was my third trip. Ah, I think Kris’ parents bought us something similar for Christmas. You can hide money in it? Morocco is on the list toward the end of this year so when you said you were going around new year I was keen to see what you thought. I’ve lived in China & Thailand so totally get what you’re saying about the market approach, I still have to be in the mood though, LOL! I was also interested in what goes on outside of the old town so thanks for including more on the city. Your Riad looked lovely and the 2 ladies sound very helpful. I’ve pinned this to go back to closer to the time. Great! Let us know nearer the time if you want any other tips.